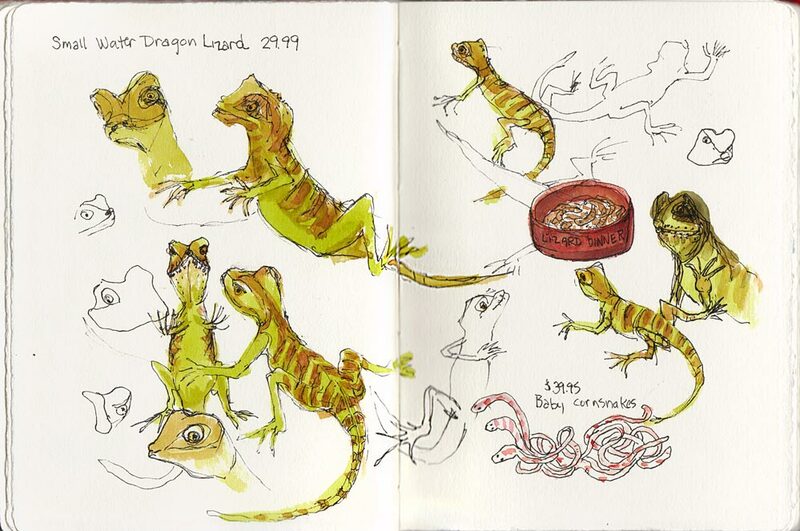 Small Water Dragon Lizard, ink & watercolor, 10"x7"
On a previous sketch night at Petco, I chose pretty little birds as my subject. This time I went for the creepy, crawly things. This little lizard was very cute and I imagined he wanted to go home with me. I’m sure my cats would have enjoyed him very much. The baby corn snakes (bottom corner above) were really weird. They moved as one and appeared like a multi-headed scramble of strings. 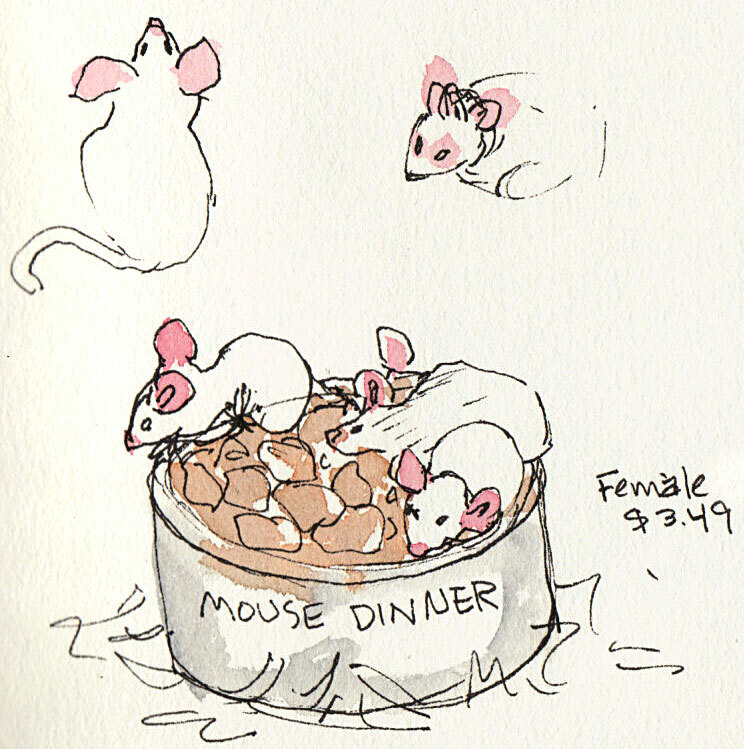 These little mousy girls were also cute, but it’s just so odd seeing animals being sold as pets that would otherwise be considered vermin. 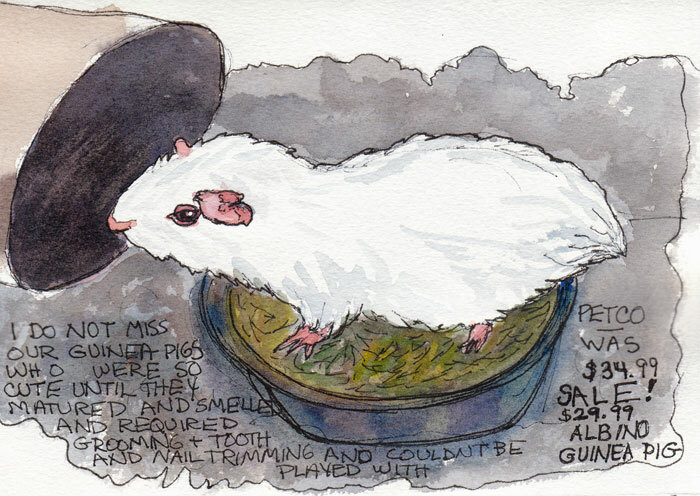 Sketching caged animals in the pet store is always disturbing to me, but is also an interesting drawing challenge. 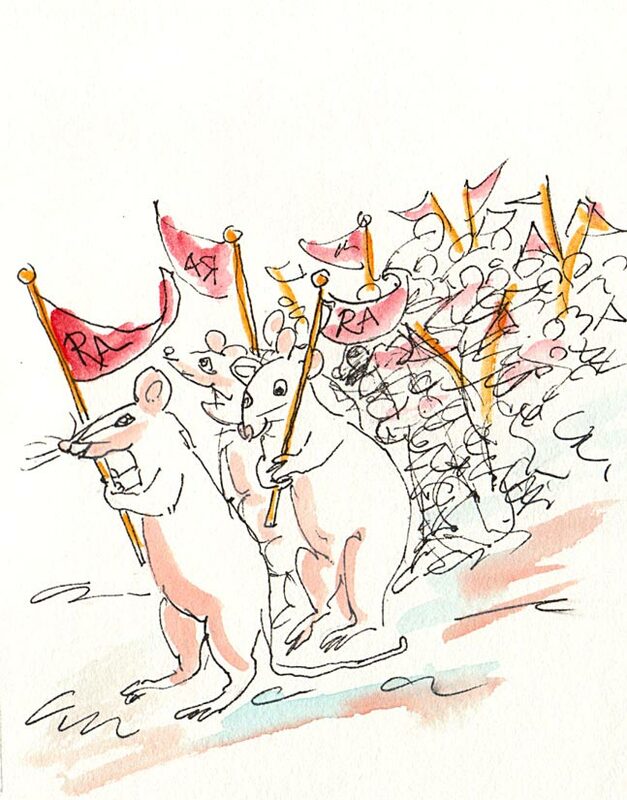 The rats seemed pretty happy in their glass box, with no need to earn a living and food, shelter and entertainment available on demand. 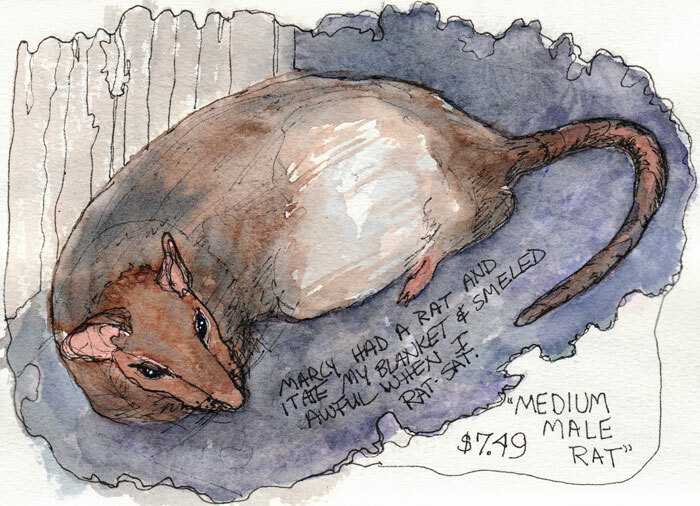 They were interesting to draw but the smell in the rodent area was quite unpleasant (to put it nicely). 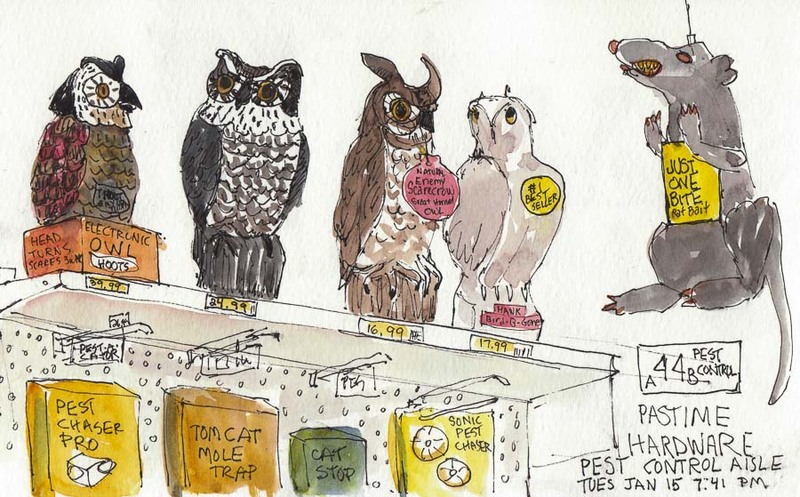 Fortunately it was time to meet up and share our sketches which we did in the scent-free aquarium accessory department. 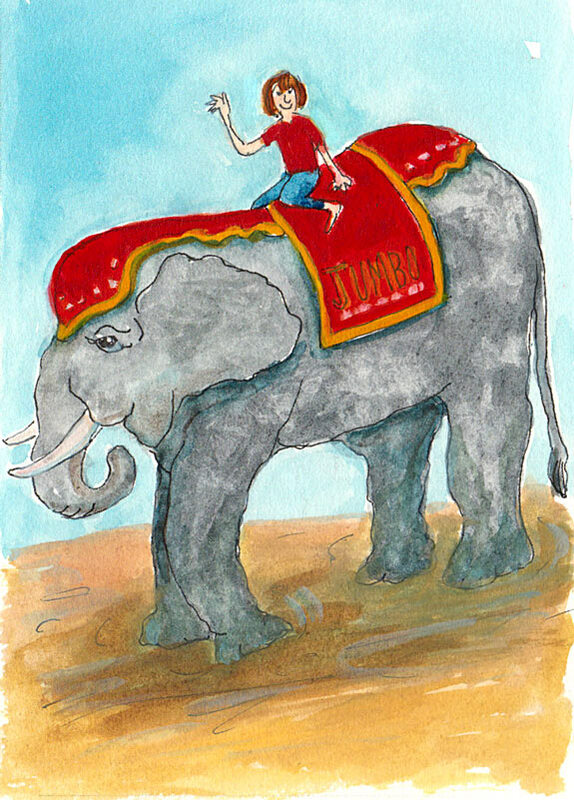 I drew this elephant to illustrate an interesting blog post for my job last week. The post is about change and uses the analogy of an elephant and a rider. 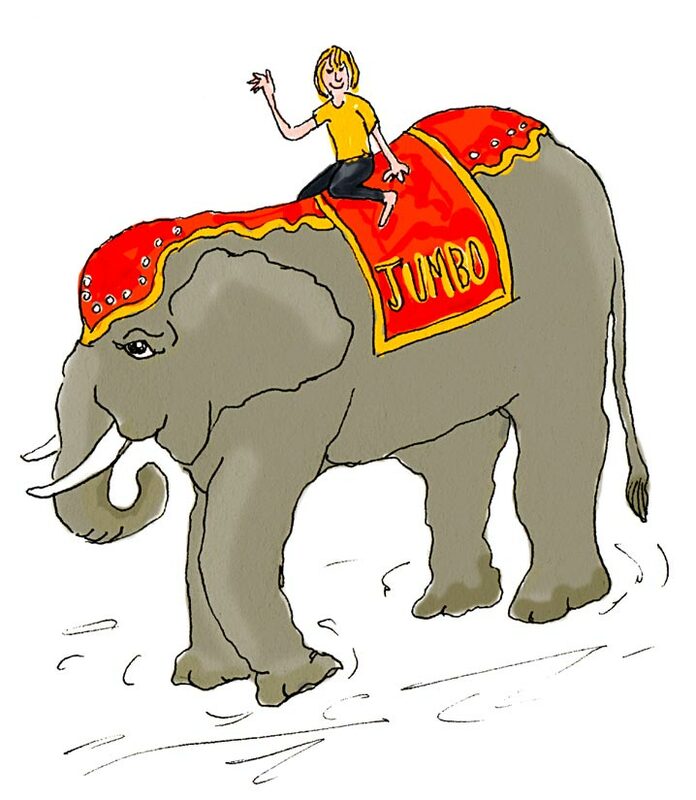 The “Rider” is our rational, analytical side and the “Elephant” is our emotional side and the author explains why you have to work with both to make a change. I drew the elephant in my sketchbook, scanned the line drawing and painted it in Photoshop. That’s the one I used for that post. 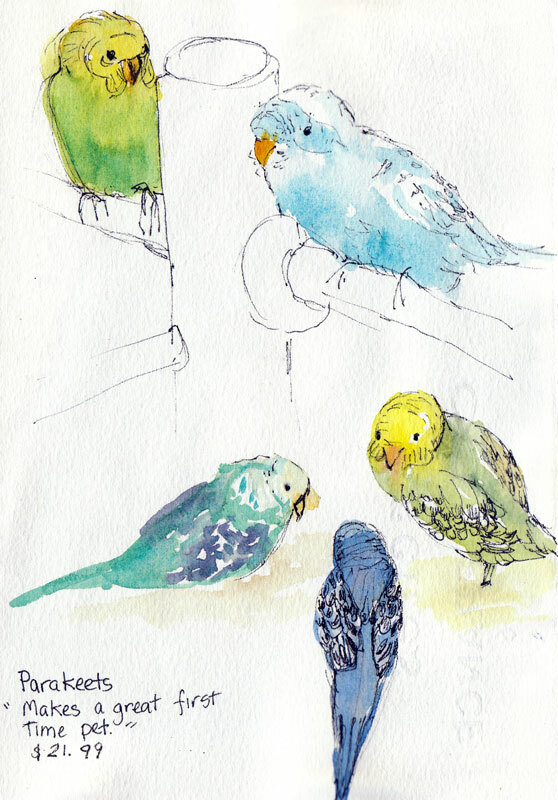 Later I painted the line drawing at top with gouache in my sketchbook. Which do you like better? 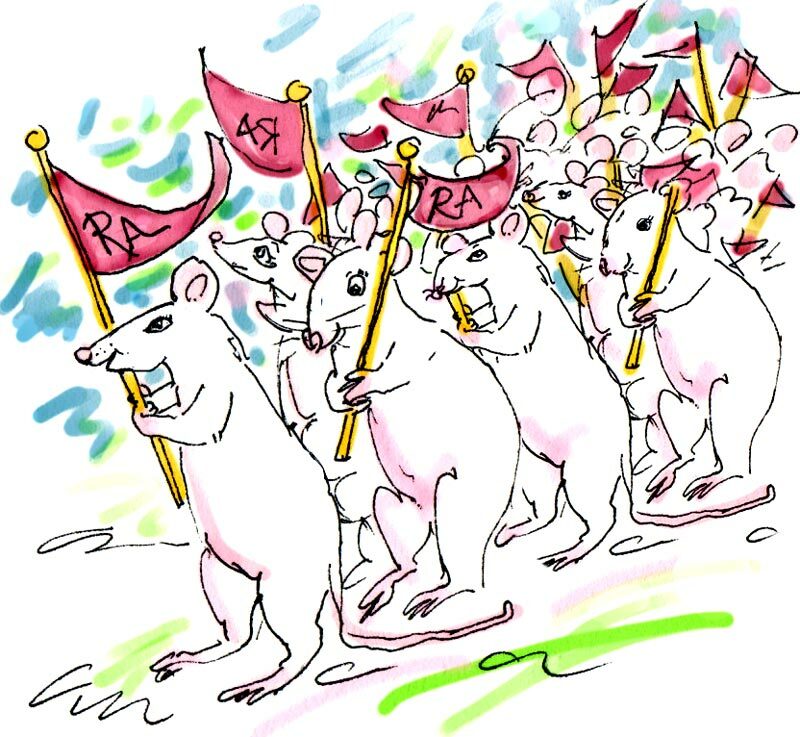 I did this illustration for the same article, but it got rejected, theoretically because two pictures were too many for the one post, but I suspect it was because rats are a little too creepy, even though it is the acronym of a group that was highlighted in the post (RATS: Reading Apprenticeship Teachers and Supporters). 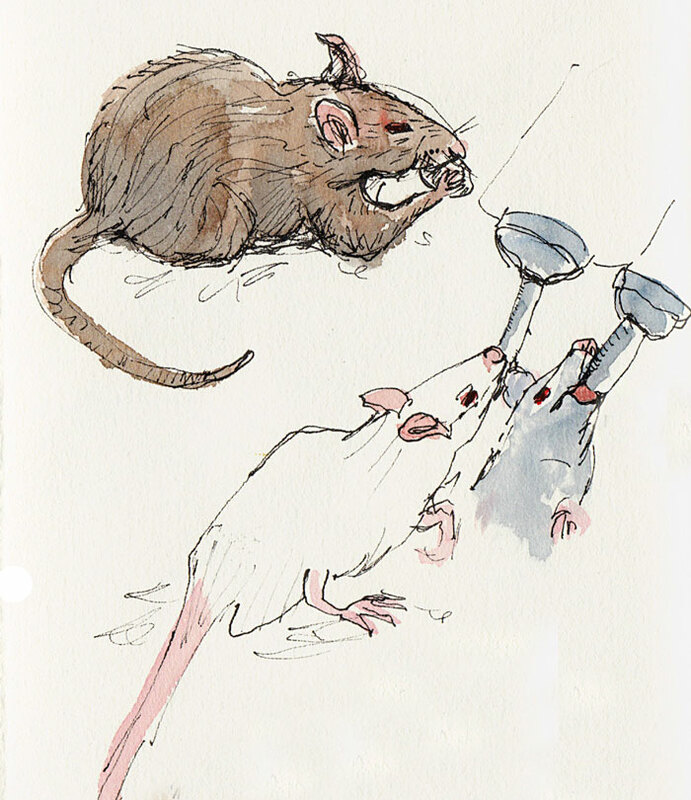 I used the same line drawing for the final illustration above, but cloned/altered some of the rats and painted and sketched more in Photoshop. This is the one I proposed for the post and got rejected. I didn’t mind, it was fun to do. It was a rainy Sunday morning and at first glance out my window the world looked gray and bleak. Then a flock of seagulls swirled by in the clouds and I looked a little closer. 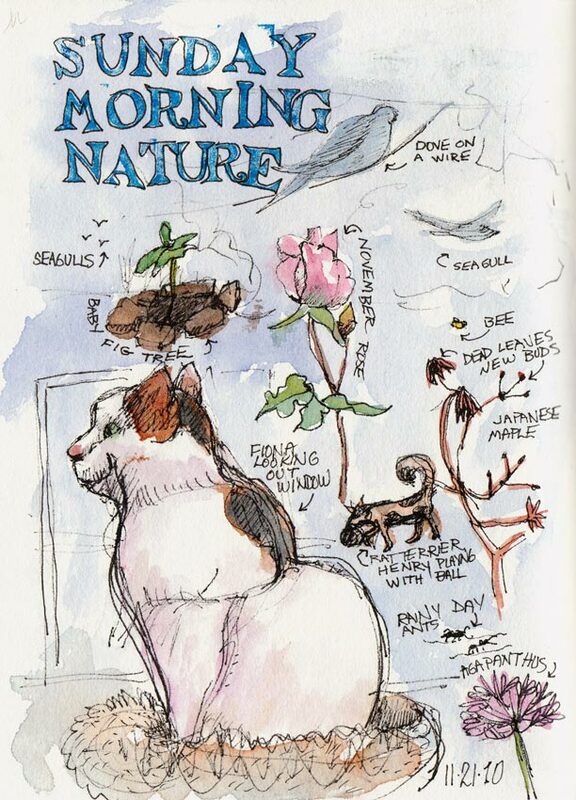 A dove sat nestled on a wire, a few ants straggled along my windowsill, a bee sniffed around a flower–a rose–beautifully blooming in November! The more I looked the more I saw and sketched. My cat Fiona joined me in looking out the window so I sketched her too. A couple of days later I drove my car to the Toyota dealer in Albany for an oil change (and free car wash). They offered a ride home but though chilly, it wasn’t raining, so I decided to walk the 3 miles instead. 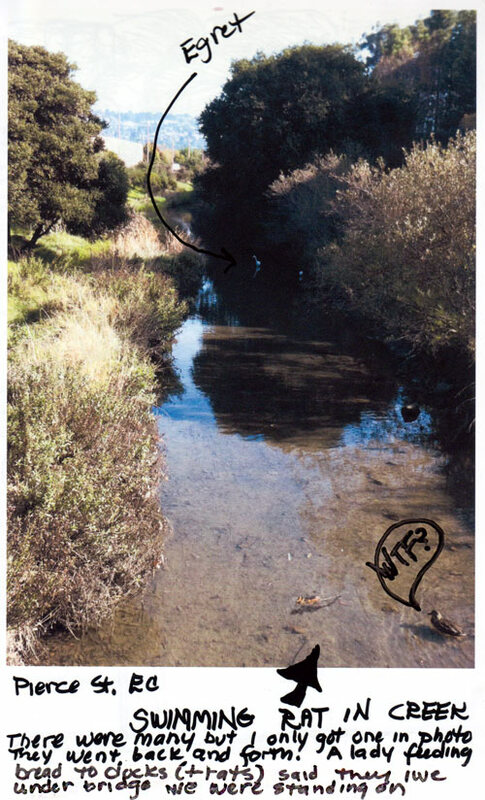 I stopped along the way to watch the egrets and ducks in the creek next door to the Pacific East Mall. SCREEEEEECH…. KABOOM! I heard tires screeching and looked up as a driver on Pierce Street tried mightily (but unsuccessfully) to swerve and avoid crashing into the car of an old Chinese man who had suddenly turned left in front of him to enter the Asian mall parking lot. 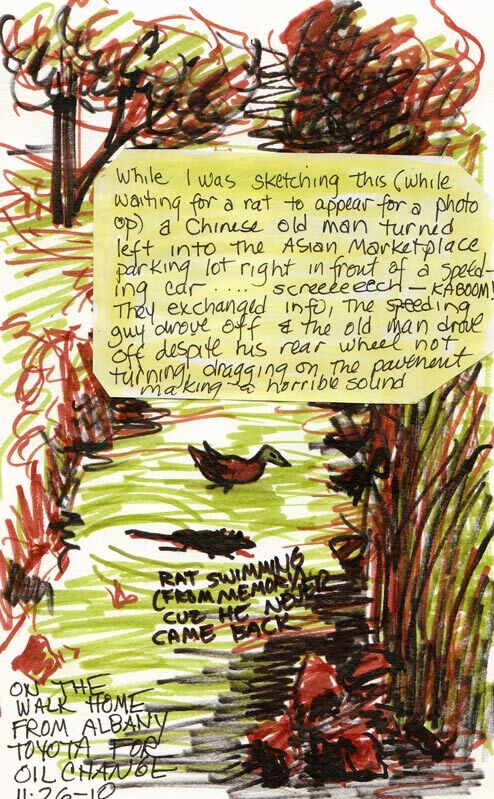 Then an old Chinese woman stopped to talk to the ducks. She told me that she brings them bread every morning. I asked her about the rats and she said, “Oh yes, they live under the bridge” we were standing on; she didn’t mind them eating her bread too.